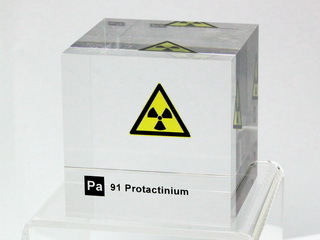 Protactinium is a silver metallic element that belongs to the actinide group, with a bright metallic luster that it retains for some time in the air. It is superconductive at temperatures below 1.4 K. Due to its scarcity, high radioactivity, and toxicity, there are currently no uses for protactinium outside of basic scientific research. Protactinium-231 (which is formed by the alpha decay of Uranium-235 followed by beta decay of Thorium-231) could possibly sustain a nuclear chain reaction; Walter Seifritz has estimated that it might in principle be used to build a nuclear weapon with a critical mass of 750±180 kg. Other authors have concluded that such chain reactions would not be possible.